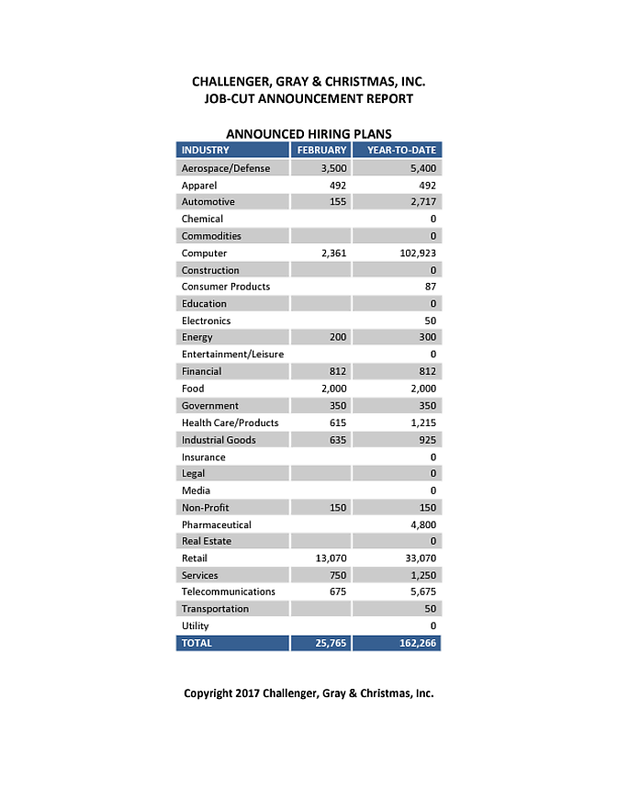 2017 February Job Cut Report: 36,957 Cuts, Down 40 Percent | Challenger, Gray & Christmas, Inc.
Last month’s total was 40 percent lower than the 61,599 cuts announced in February 2016. Employers have announced 82,891 job cuts so far this year, which is a 40 percent decline from the 136,713 job cuts announced through February of last year. Retail continues to lead all sectors in job cuts as the industry pivots toward online and shrinks brick-and-mortar operations. Retailers announced 11,889 job cuts in February for a two-month total of 34,380. Retail cuts are nearly 580 percent more than the 5,930 cuts recorded in the energy sector, the next highest industry so far this year. “Retailers are experiencing a tremendous transformation from the traditional business model. The cost of digitizing merchandise, moving sales to online, and downsizing physical stores will likely take a toll on employees in this field,” said Andrew Challenger, vice president of Challenger, Gray & Christmas. The largest layoff announcement last month came from JC Penney which will close 140 stores and cut 5,500 jobs. Grand Rapids-based Family Christian Stores is closing 240 stores in 36 states eliminating 1,300 workers, while L.L. Bean announced buyouts to over 900 staff in an effort to trim 10 percent of its workforce. “Despite the cuts, this shift in retail will ultimately create new opportunities for job seekers, but they will need the requisite skills. The new retail employee will need considerable tech abilities, in addition to the necessary customer service experience,” added Challenger. Indeed, retailers are seemingly adding jobs just as quickly as they are cutting. Through February, Challenger has tracked over 33,000 hiring plans announced by retailers. According to the latest data from the Bureau of Labor Statistics, retail experienced the most job gains in January with 46,000 jobs added. The energy sector, meanwhile, recorded an 87 percent decline in job cut announcements compared to this point last year. Energy companies announced 5,930 cuts through February this year, versus 45,154 job cuts during the same period in 2016. Oil and gas companies announced 3,281 of the 4,077 energy sector job cuts last month. “The energy sector announced over 107,000 jobs last year. It seems the bleeding has stopped for now. The new administration and EPA chief Scott Pruitt have already enacted legislation to aid oil & gas companies, but it remains to be seen if those actions will result in more jobs,” said Challenger. February saw an increase in financial cuts as employers in this sector announced 3,292. That is 1,166 percent more than the 260 announced in January and 227 percent more than the 1,006 cuts announced in February 2016. “The finance industry is experiencing its own shift to digital, which while causing job loss is also creating jobs. Finance experienced the third most job gains in January, according to the BLS,” noted Challenger. Hiring announcements are at an all-time high, according to Challenger tracking. In the first two months of the year, employers have announced plans to hire 162,266 workers, the bulk of which came from Amazon’s January announcement to hire 100,000 workers. That is the highest January-February hiring total on record. The next highest total for the first two months of the year occurred in 2013, when employers announced plans to hire 152,957 workers.